The Colorado Rockies have endured a lot of losing over the last seven years, and the one player who has remained with the team through it all is all-star outfielder Carlos Gonzalez. Alas, now that the team is prepared to make some noise in 2017, Gonzalez is entering the final year of his contract. Despite his loyalty to the team throughout years of losing, the Rockies are not currently discussing a contract extension with Gonzalez, even with free agency just a few months away. Earlier this offseason, there were reports of mutual interest between the Rockies and Gonzalez in discussing an extension, and with good reason. Aside from an injury-plagued 2014 season, Gonzalez has been one of the most productive and consistent outfielders in baseball during his time in Colorado. He is a former batting champion, two-time Silver Slugger winner, three-time Gold Glove winner, and a three-time all-star, including last season. Perhaps more importantly, the 31-year old Gonzalez has showed no signs of slowing down at this stage in his career. Gonzalez says that the team approached him earlier this winter to see if he had interest in remaining with the team beyond this season. Gonzalez expressed interest in a contract that could keep him in Colorado for the rest of his career, seeing the young talent around him that could finally make the Rockies a playoff contender. However, he says the team has not pursued talks with him beyond merely gauging his interest in staying with the team. Gonzalez is no doubt disappointed at the lack of extension talks, especially after the Rockies approached him earlier this offseason. Nevertheless, he remains focused on the upcoming season, especially now that the Rockies may finally have a team that can compete in the NL West. When asked about the possibility of signing Gonzalez to an extension before he reaches free agency, Rockies GM Jeff Bridich declined to comment. Such a reaction displays no urgency on the part of the Rockies to keep Gonzalez in Colorado. Without an extension, trade rumors involving Gonzalez, something that has been quite common in recent years, may be inevitable this summer, especially if the Rockies aren’t legitimate playoff contenders. In a way, the signing of Ian Desmond earlier this winter may have been a sign that the Rockies are preparing to move on from Gonzalez after the season. 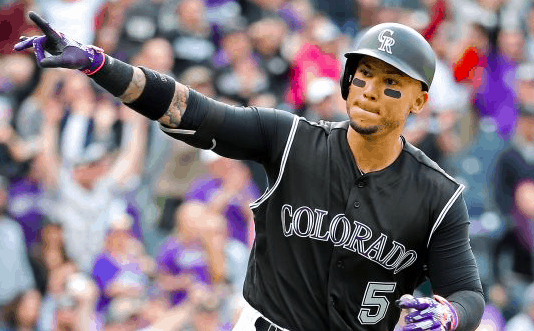 Desmond is set to be Colorado’s first baseman this year, but he could conceivably move back to the outfield the following season if Gonzalez were no longer in right field. The Rockies also have a pair of young outfielders in David Dahl and Raimel Tapia, who are competing for playing time in the outfield this year and could make it easier for the team to move on from Gonzalez after the season. Between the abundance of outfielders on Colorado’s roster and the team’s lack of initiative in extension talks, Gonzalez is in a rather uncomfortable position heading into the season, knowing this could be his last year with the Rockies whether he likes it or not. But years of dealing with trade rumors appear to have prepared Gonzalez for a life of uncertainty.